This picture was taken at the elementary school in Belang and is indicative of what Nancy and I saw on one of our first trips to Bali, happy children but a school in great need of improvement. As we visited more schools we found that the schools were in a dilapidated condition with leaking roofs, large holes in the floors, walls that had not been painted in 20 years, broken windows and few, if any, educational materials or library books. We also noticed that the school day was short and that the traditional teaching was focused on preparing children for national tests and therefore there was no emphasis on critical and creative thinking, or discussion. Bali is a beautiful island with its rich traditions and authentic culture. However, we were concerned that the children’s education had been compromised. We felt we could make a difference and help remedy some of the problems by becoming involved with poor rural elementary schools. After gaining approval from appropriate school and village officials to provide educational assistance, we organized a foundation in the United States to raise money for improvements. Our focus was to provide a clean, safe and exciting facility in which to have an experiential and nurturing learning experience, to provide additional hours in which to learn, and to provide resource materials that enrich and broaden the children’s experience. We started with one school, located an unused building on the school grounds, renovated it, purchased books and educational materials and hired a teacher to provide supplemental educational programs in the afternoon. 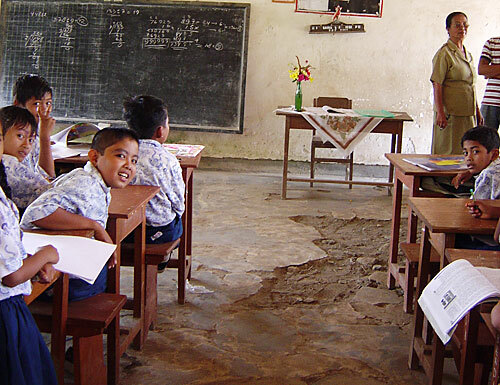 After learning from this first school, we subsequently located three additional rural schools. In total there are 505 students at the four schools. Our goals going forward are to continue to enhance the children’s learning experiences in these learning centers by increasing the size of the libraries from their current total size of 1800 books, to add additional educational materials and to implement new experiential learning programs for the children.